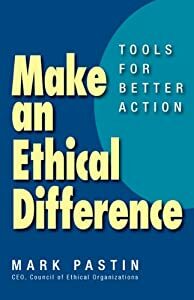 One of the most popular topics in my writing and speaking is how to influence ethically. I am pleased that SoundviewPro, which is the same company that does Executive Book Summaries, has made available a full video-based course titled “Influence with Ethics.” The course consists of four separate classes each built around practical tools for being effective at influencing with ethics. You can preview the course at https://www.soundviewpro.com/online-courses/_/influence-with-ethics/. Be sure to let me know if the course helps you and how it can be improved.